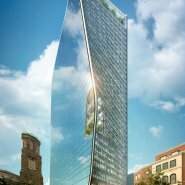 Designed by AS+GG for Tony Giarratana and Associates, 505 CST in downtown Nashville, Tennessee, will be one of the most energy-efficient and highly sustainable mixed-use buildings in the world. 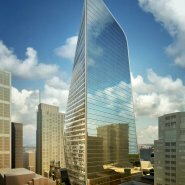 The 605-feet-tall, 38-story, 1.2 million-square-foot building at 505 Church Street is designed to achieve a LEED Platinum rating from the U.S. Green Building Council and attract tenants in search of technologically advanced, high-performance commercial, hotel and conference space with the lowest possible energy costs and environmental impact. The building will also meet the aggressive energy use intensity (EUI) goals of the 2030 Challenge, an internationally recognized challenge for architecture practices to design more energy efficient buildings and move energy consumption toward zero fossil fuel usage by the year 2030. 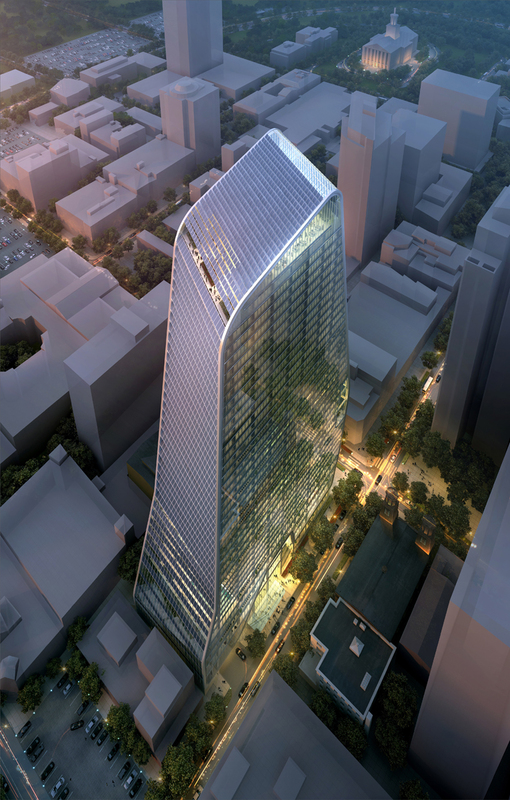 To those ends, the 505 CST design incorporates a unique torqueing form, environmentally strategic site orientation, a double-skin facade, building-integrated photovoltaic panels, solar shading, under-floor air distribution, skygardens and a variety of cutting-edge building systems—designed by PositivEnergy Practice—to produce one of the most technologically advanced buildings of its kind. Energy savings will be achieved by curtain walls tailored to each exposure. 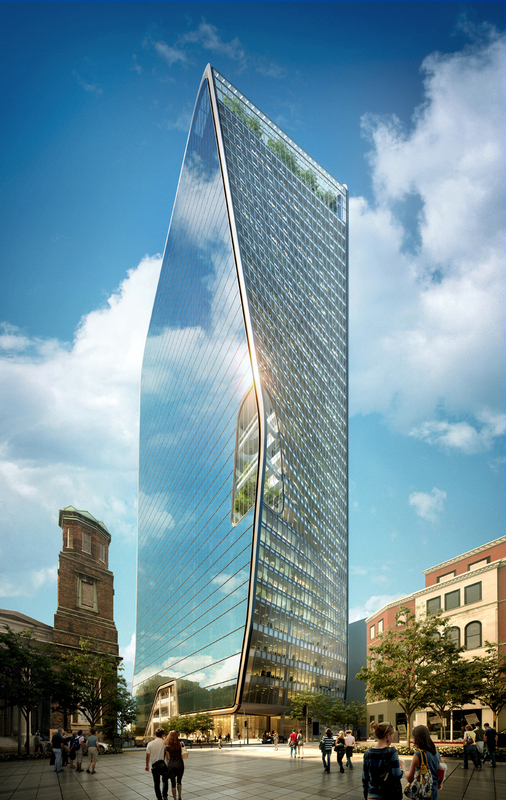 A double-skin façade on the building’s southwest face will feature an eight-inch, internally ventilated cavity, which captures solar heat in warm months and exhausts it up and out of the building, reducing cooling loads for the interior. In winter months, warm air collected inside the interstitial space will be used to temper incoming ventilation air, reducing heating costs. The northeast wall, which has less solar exposure than the southwest facade, incorporates a triple-glazed curtain wall with controlled internal shades to protect against the early morning heat gain. The south facade is designed with a self-shading, horizontally folding curtain wall incorporating photovoltaics on the upper surfaces exposed to the sun. By these and other means, the design team has been able to produce an exterior wall system consisting of approximately 60 percent vision glass and 40 percent solid wall, as opposed to the 40/60 vision/wall ratio that would normally be required to achieve the energy goals of the 2030 Challenge. This will allow for spectacular views of downtown Nashville for building tenants while maximizing their human comfort levels and minimizing their energy costs. 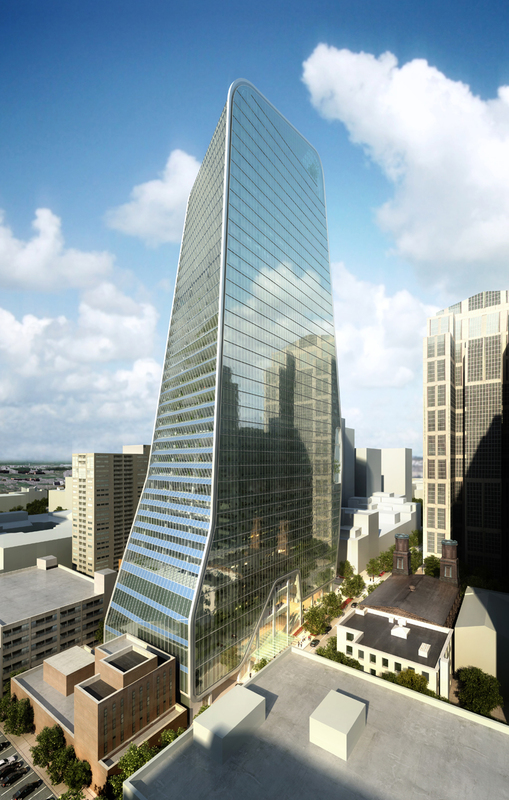 The building’s design could also take maximum advantage of synergies with downtown Nashville’s district heating and cooling system, which will pipe chilled water to a storage tank in 505 CST’s basement during off-peak hours at night, when the demand is lowest and the district system’s excess generation capacity is highest. Building systems will also collect and re-use rainwater and condensate from mechanical systems for use in plumbing fixtures and irrigation. 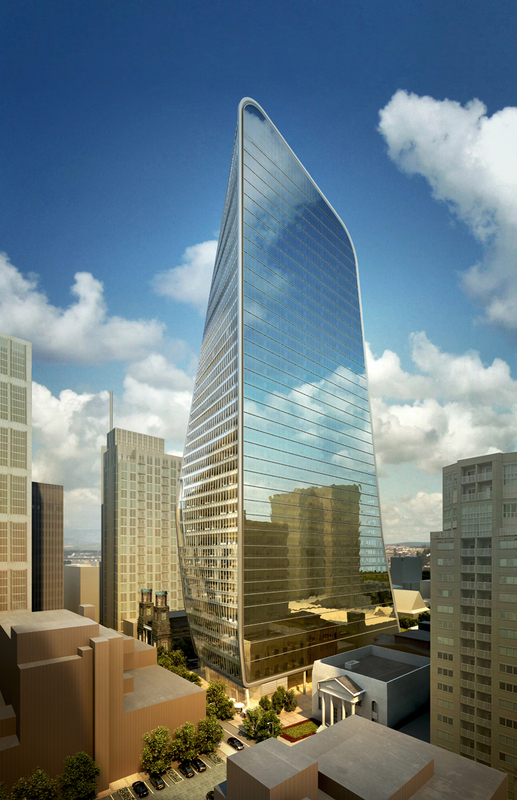 505 CST will also feature an under-floor air distribution system which will increase human comfort and reduce energy costs by introducing heated or cooled air from floor level, closer to building occupants, rather than from an overhead system, as is typical in conventionally designed buildings. An on-site cogeneration facility is planned to generate electricity from clean natural gas, while waste heat from the generation process will be used to heat hot water in the building throughout the year. 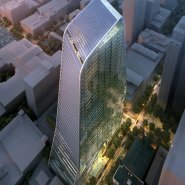 Daylight harvesting controls will yield significant savings in lighting energy consumption and will help to maximize the energy-saving potential of the building’s high-performance curtain wall system. Other key elements of the design are two lushly landscaped skygardens, at midrise level and on the building’s rooftop, which will provide stunning amenity spaces and spectacular views for building occupants and visitors. 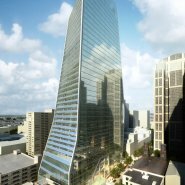 505 CST will have approximately 700,000 square feet of office space; a 200-unit, 5-star hotel; and a two-story conference center with a ballroom, a restaurant, a health spa with pool and a business center. Underground parking with accommodate 1,000 cars.